The Jetta is Volkswagen’s number one selling car in North America, so there is always pressure on the Jetta to rack up sales for VW. 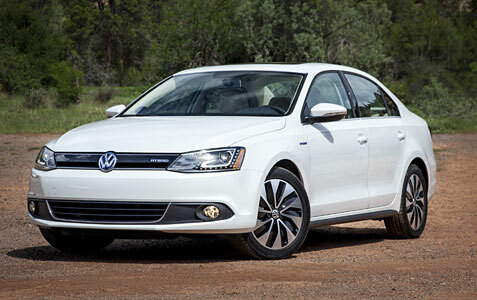 The 2014 VW Jetta SE we tested sported a reflex silver metallic paint that was as clean as any paint we’ve seen. First impressions are important and the Jetta came out of the gate strong. Volkswagens in general have a distinct look, and the Jetta is no different with a sleek design that looks smart and sporty. At the front, the coupe-like incline of the windscreen and the consistent use of horizontal lines define the Jetta’s design. The horizontal blades in the grille, together with the blades in the lower intake, are designed to make the Jetta appear wider and more dynamic. Volkswagen completely redesigned the Jetta a few years back and crafted a bigger car, with a longer wheelbase and 2.9 inches added to the overall length. The increased dimensions allowed designers to incorporate clear, precise lines and muscular surfaces to impart a timeless elegance, giving the impression that this is a car from a higher class. The 16-inch alloy wheels looked sweet and also came with all-season tires. The Jetta gets right to the point inside and out, and the cabin space is no nonsense. A key benefit of the Jetta’s extended wheelbase—it stretches an incredible 104.4 inches—is a truly spacious interior, with impressive rear-seat legroom of 38.1 inches. Long legs can rejoice. The gently arcing roofline also means more than ample headroom of 37.1 inches for rear-seat passengers. And stretch-out legroom in the back isn’t achieved by a cramped front seat either. Being tailored for an American audience, there is no shortage of legroom and headroom up front. Just open any of the Jetta’s wide-angled doors and the quality of materials – the fit and finish, and the clean, simple, refined elegance of the cabin – is clearly visible. And in true German tradition, the layout of the fascia, the positioning of the switches and controls, and the clarity of the oversized, round instruments is designed to be ergonomic and intuitive. Trunk space also borders on the cavernous. The Jetta offers a class-leading 15.5 cubic feet of usable trunk space, and can be increased significantly by folding forward the 60/40-split rear seatback. The rear seatback is also offered with a pass-through to accommodate longer items, like skis. Move up to the SE (as tested) and additional standard features include: heatable front seats; cruise control; standard V-Tex leatherette seating surfaces; an adjustable center armrest with storage compartment; a six-speaker sound system; and a Media Device Interface (MDI) with iPod adapter. Premium features that are available on the Jetta include: a six-way power driver’s seat; a leather-wrapped multifunction steering wheel; a soft-touch dashboard; two-tone V-Tex leatherette sport seats; the RNS 315 navigation system; the acclaimed Fender Premium Audio System; keyless access with push-button start; VW Car-Net connected services; Bluetooth connectivity; and a rearview camera. Exterior enhancements include a chrome radiator grille and chrome window trim. The new 1.8 liter turbocharged 170 horsepower engine is a blast to drive and delivers the kind of efficiency that might surprise you! 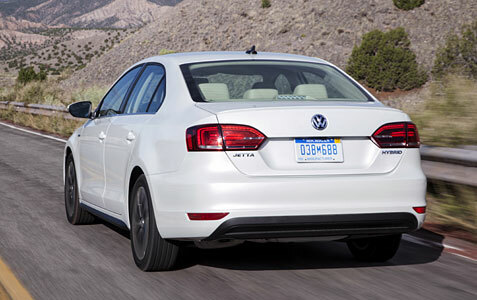 The Jetta 1.8T SE and SEL models feature a new EA888 Gen 3 turbocharged and direct-injected four-cylinder engine. This 1.8-liter engine produces 170 horsepower and 184 pound-feet of torque—the same power, but seven pound-feet more torque, delivered lower in the engine speed range than the 2.5-liter five-cylinder powerplant. The EPA estimated fuel economy rating is 26 mpg city and 36 mpg highway when equipped with the five-speed manual transmission, and an impressive 25 mpg city and 36 mpg on the highway with the six-speed automatic. The six-speed transmission is very smooth and provides what we found to be one of the best performing cars in this class. The EA888 Gen 3 engine family is designed to be lighter and more fuel efficient than the Gen 2 units. Engine weight has been reduced by eight pounds, to 290 pounds overall. Among the improvements on this engine are: a thinwall crankcase casting; exhaust headers that are integrated into the cylinder head; smaller diameter main bearings; roller bearings for the twin balancer shafts; and a crankshaft that has four counterweights instead of eight. All Jetta models are fitted with a strut-type front suspension with coil springs, telescopic dampers and an anti-roll bar. There aren’t too many surprises out there in this midsize car segment, but for a sticker price as tested of $23,985, the 2014 VW Jetta SE will both surprise and impress you. From the great looks to the smooth drive, you get the feeling (and others agreed) that this car is very reasonably priced. The design is also one that has staying power where some competitors are out of style within a few years or one cycle. The Jetta is a quality vehicle with real style that carries a real world value price!